What happens when WIMPs collide — with you? The general concept of dark matter is well-accepted, scientifically. We’ve determined that the majority of the matter out there doesn’t radiate, so we can’t see it, but it’s contributing to the masses of the structures we observe in the Universe, interacting gravitationally with everything around it. One theorized candidate for dark matter is the category of WIMPs, or Weakly Interacting Massive Particles. The idea of WIMPs supposes that there exists a new type of subatomic particle that is, as of yet, undiscovered. WIMPs can be thought of as very massive versions of neutrinos; they’re electrically neutral and they only interact via the weak and gravitational forces, not via the strong or electromagnetic forces. Our best bet for trying to directly detect WIMPs is to look for events where they elastically scatter off of the nuclei of ordinary matter in the galaxy. There exist many experiments attempting to measure just that, with conflicting results. Experiments such as DAMA, CoGeNT, and CRESST have found evidence that WIMPs exist, and provide bounds on the scattering cross-section for these particles based on their detections. On the other hand, many more experiments such as CDMS and XENON have had null results, placing even more stringent constraints on WIMP scattering. To read more about this controversy, you can check out this astrobite. The authors of this paper are similarly interested in the elastic scattering of WIMPS, but they they focus on a different question: assuming WIMPs exist and explain the Universe’s dark matter problem, what impact do they have on humans? Figure 2: Calculated rates for collision of 60 GeV WIMPs with nuclei of various atoms found within the human body. See text for details; Table 1 in the paper. The first thing the authors attempt to calculate is the collision rate of WIMPs with nuclei in a typical human body. The WIMPs are treated as though they exist in a non-rotating, isothermal sphere of dark matter in a halo about the galaxy (see Figure 1) with a Maxwellian velocity distribution. These assumptions are components of something called the Standard Halo Model, discussed in this paper in 1986 and commonly chosen as a simplified description of dark matter halos. Assuming a typical human body mass of 70 kg, this model results in billions WIMPs passing through an average human body every second. To calculate the actual rate of collisions with nuclei within the body, the authors then use the published constraints on the WIMP scattering cross section from the dark matter detection experiments, finding the collision rate for multiple WIMP masses in the 1 GeV – 1 TeV range. They specifically focus on WIMPs of mass 60 GeV, which can be constrained by the null results of XENON and CDMS, and WIMPs of mass 10–20 GeV, as they can be constrained using best-fit models to the DAMA, CRESST, and CoGeNT data. The table in Figure 2 summarizes the maximum collision rates found for 60 GeV WIMPs with various nuclei in the human body. The two columns indicate two different types of elastic collisions: spin-independent (SI) and spin-dependent (SD). In the spin-independent collisions, the WIMP couples to the mass in the nucleus, whereas in the spin-dependent case, the WIMP couples to the spin of the nucleus. 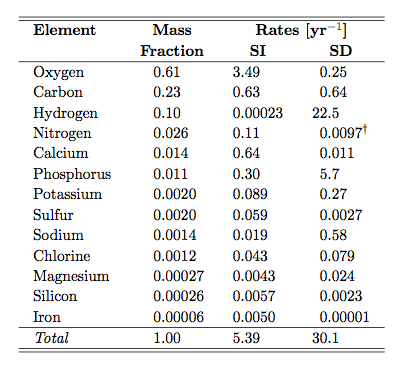 The difference between these types results in different nuclei dominating the collisions: scattering with oxygen is the dominant contribution in the SI case because oxygen is the largest component in the human body by mass, but scattering with hydrogen is the dominant contribution in the SD case because hydrogen is mainly composed of spin-1/2 1H, whereas oxygen and other elements in the table are mainly composed of spinless isotopes. The authors conclude that we can expect ~10 collisions of 60 GeV WIMPs with nuclei within our bodies each year, and ~105 collisions with 10–20 GeV WIMPs — almost one per minute. So should we be concerned about WIMPs wreaking havoc with these collisions? The authors perform a simplified calculation to answer that question, making the assumption that the havoc wreaked is directly proportional to the energy these particles deposit in our body. Muons from cosmic rays, which we know to pass through our bodies at a rate of roughly a few per second, each dump about 10–100 MeV of energy into our bodies without causing any damage. WIMPs radiate during their collisions as well, but they’ve got a lower collision frequency, and they only deposite ~10 keV of energy each. In fact, the radiation dose from cosmic rays received each second exceeds the lifetime radiation dose we could expect from WIMPs! If WIMPs really are the answer to the dark matter mystery, this paper gives us an idea of how that dark matter interacts with us — as well as one ready response to potential safety concerns!